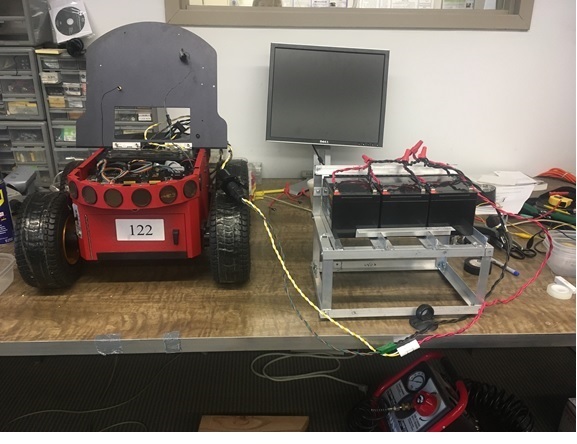 This project started as a way to support the need for more power longevity during testing with the Pioneer 3AT robots. They are equipped with 3 12V batteries which on full charge will power about 60 to 90 minutes of robot activity at most. The 'add on' batteries used for this pack were three 12V 12AH Lead Acid Casil Batteries about 4” by 6”. While these batteries were several inches too large to fit in to the robot itself, the voltage and current were compatible enough that they could easily be added in parallel to the standard batteries used. And they had a higher AH rating than the usual 12V robot batteries (7 to 9 AH). In order for the batteries to be easily added to the bot without interfering with functionality or taking up the valuable real estate the top of the bot offers, a mount had to be constructed. The connector we used between the batteries and the bot itself was a standard RV connector -- allowing for a quick connect/disconnect. To test the new battery pack, the robot was confined within a 20 meter-sq area and the wander mode of the Mobilerobots Aria Demo program invoked. The robot was timed from full charge to full-stop for the regular battery case and the batter booster pack case. The robot lasted for over twice as long with the booster pack! See the testing in progress Testing Video.